Rivalry is one of the bookmakers focusing exclusively on eSports, the new and extremely popular branch of betting. Established in 2018, it has already established itself as one of the prominent sports books for major video game tournaments. Rivalry is licensed by the Isle of Man Supervision Gambling Commission and has adhered to the Responsible Gambling policies. 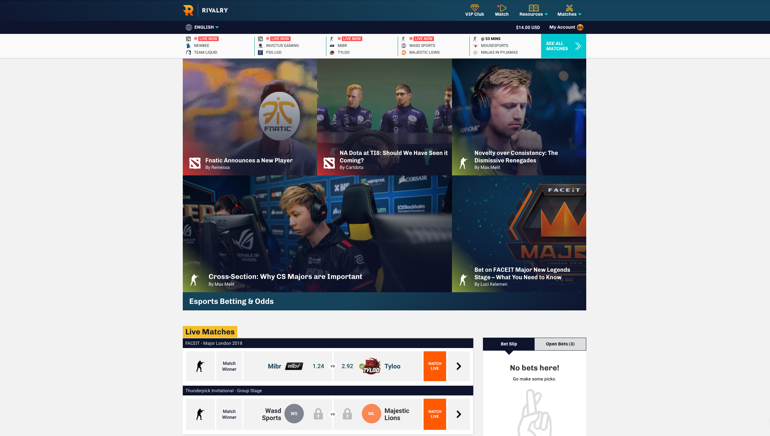 Players can translate its mobile-friendly website in Spanish, Chinese, Russian and South Korean, while the default version is English. Rivalry has a burgeoning selection of betting markets, for first-person shooters, RPGs, strategy and card games. 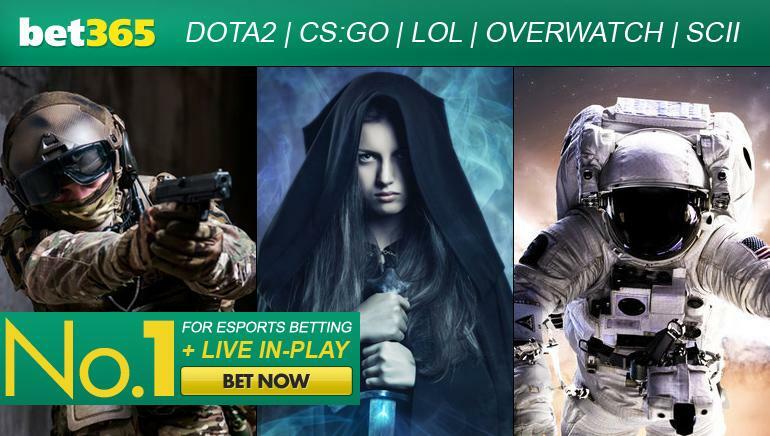 CS:GO, Dota 2, League of Legends, Overwatch, Call of Duty, Hearthstone and Starcraft events and international leagues are covered, with hundreds of betting options every day. Punters can bet on upcoming tournaments, daily games and also in real-time on matches that are underway. 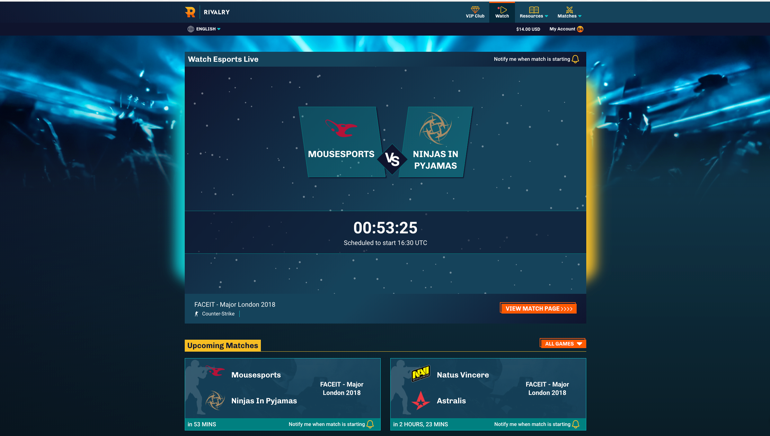 Live matches are displayed in the upper half of the website, but players have the option of browsing based on video game. Counter-Strike: Global Offensive and Call of Duty are the most popular first-person shooters and their flagship tournaments enjoy the coverage they deserve here. MOBAs spend even more time in the spotlight, since Dota 2 and League of Legends are the video games with the most fans and the biggest prizes. The most popular Blizzard games such as Overwatch and StarCraft are not forgotten and members can bet on their tournaments on the outright winners, as well as the outcome of each series. Rivalry is a mobile-friendly bookmaker, where punters can pick up their iOS and Android-powered smartphones and tablets to wager. 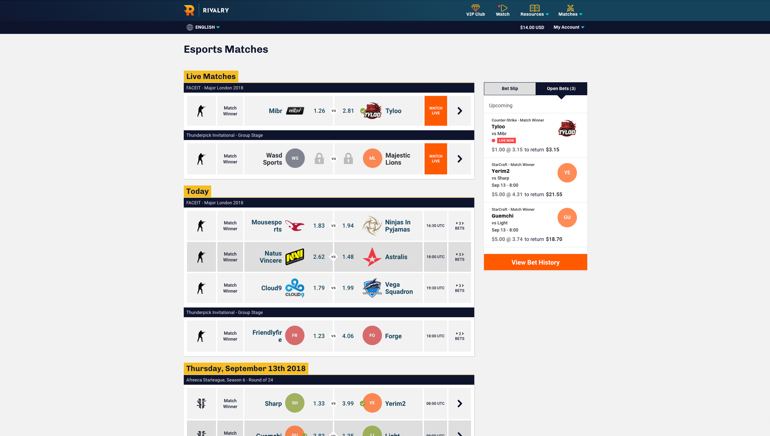 The odds are refreshed quickly during live matches and players are also provided with relevant stats on upcoming games. This makes it easier to pick winners and in the long run, players can hone their skills even further, by visiting the “Resources” section and the Rivalry Academy. Rivalry bonuses are offered to new members, as well as those who already have an account and are willing to participate in ongoing campaigns. Terms and conditions apply to these offers, just like they do at traditional bookmakers and punters are expected to go over them carefully. As long as they uphold their end of the deal and respect the rules, they can expect the sportsbook to pay their bonuses promptly. The US dollar is the only currency accepted at Rivalry, while punters can choose between two popular payment methods when loading their account. Entropay and Skrill can be used to deposit funds instantly and cash out winnings, with players being charged no fees or commission. 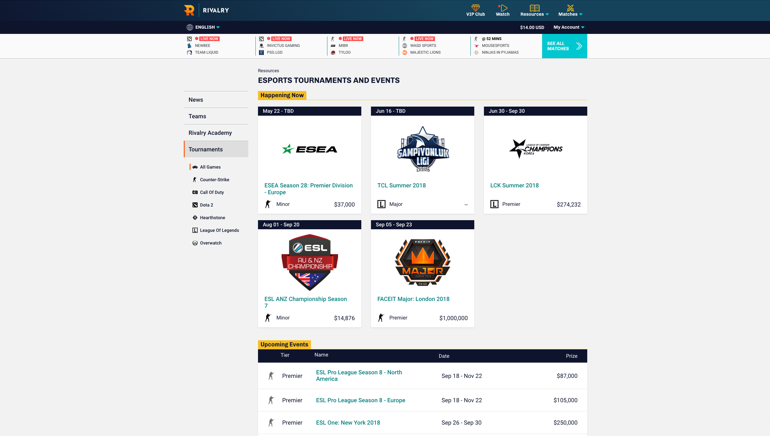 Rivalry is a modern eSportsbook, which strives to build a solid reputation and project an image of trustworthiness. Their customer support team diligently works towards achieving this goal and their specialists can be reached via live chat and email. Players can ask questions right away and give feedback by simply starting a conversation with one of their customer support experts who speak five languages. The biggest selection of eSports you can bet on with a generous welcome offer of €50 match bonus!